On quite possibly the most epic night of my life, EVER. I captured this beautiful photograph of the Milky Way soaring over the Richland Valley near the Nars along the Buffalo National River. I had decided to camp out and view the Perseid Meteor shower on this warm summer night in August of 2012. It paid off, extremely well. 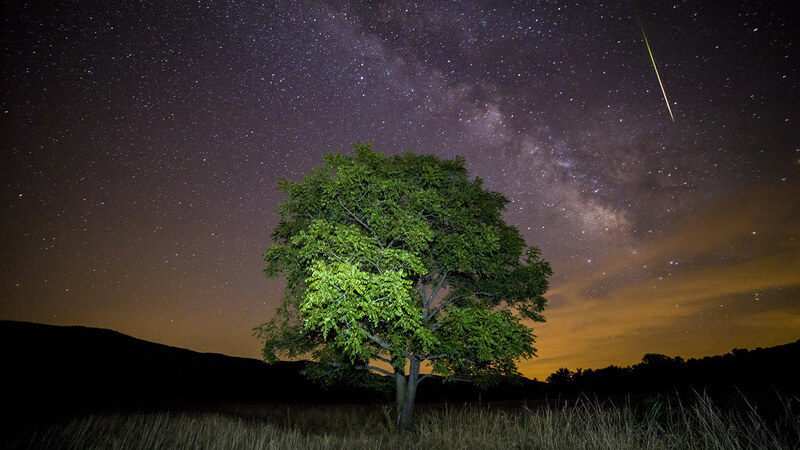 At the time of actually photographing this tree, I never even saw the Perseid in the top right of the frame. I was too busy trying to light paint the tree and make sure that it was well exposed, so I was paying far too much attention to it. The great thing about this photograph is the surprise I received when seeing the meteor for the first time. I was simply going through my photos in Lightroom, like I always do when I return from one of my trips, and out popped one of the most unique scenes I’ve ever captured on camera. It’s not every day you get a really cool meteor on top of a well exposed light painted tree. Since that shot and since various other shots of this tree, I’ve pretty much deemed this tree my favorite in Arkansas. It’s in the middle of a giant field, surrounded by Elk a majority of the time, and alone. It stands like a sentinel guarding the Richland Valley near the Nars and has quite the presence about it when you’re photographing it.